What a few weeks! My nephew Emerson has been in and out of the hospital 3 times! He was admitted again today. He was cutting 4 of his 5 year molars, and had Strep Throat. They've done blood tests, scans to see if his hernia is pushing up against his heart (it's not) and more tests. Now he doesn't have Strep, so what's up? We don't know. He has labored breathing, rapid heart rate, at times a fever, and hasn't been sleeping. They called in a neurologist to help see what's up. 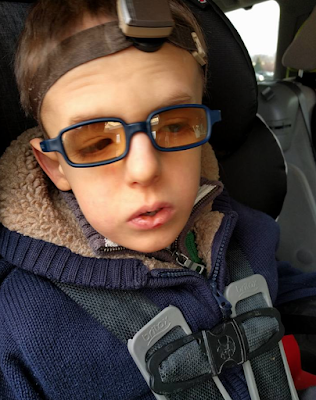 Speaking of Emerson - he just got new glasses. I happen to love them. He also has on a hand me down, which is Isaak's coat. Emerson looks way tired, but cool as a cucumber in his glasses and coat. They we got a call earlier this week that my oldest nephew Ethan that's in high school was rushed to the hospital because he had to get his appendix out. He's my older sister's son. I'm really loving, yet hating hospitals right now. A kid that kept getting in trouble at camp because he was picking on Isaak pushed him last week. Isaak fell back. The kid is getting kicked out. Apparently Isaak wasn't even doing anything wrong. Isaak's taken in the camp director's son under his wing. The little Kindergartener went over to tell his Dad what was going on. Mica helped Isaak up. Then Mica offered to give Isaak some Skittles that he won. Way to go Mica for standing up to his brother! If they wouldn't remove the kid that picked on Isaak - I'd remove my kids. Work is busy. There's only 2 weeks left of the semester. I took off 2 days when Mica was sick last Tuesday and Wednesday. I feel swamped with Christmas stuff and work. What's random in your life? Emerson will always be the cutest kid ever! Love the glasses! Way to go Mica. It's awesome to know you've got your brothers back! Emerson is such a big boy now... LOVE seeing him growing up.